Phnom Penh (FN), Jan. 31 - Prime Minister Hun Sen’s Cabinet, through an exclusive interview with Fresh News CEO Lim Chea Vutha, rejected the fake letter that guided the five ministries, including defense, interior, foreign affairs, economy, and civil service, to submit documents directly to the cabinet rather than Council of Ministers. 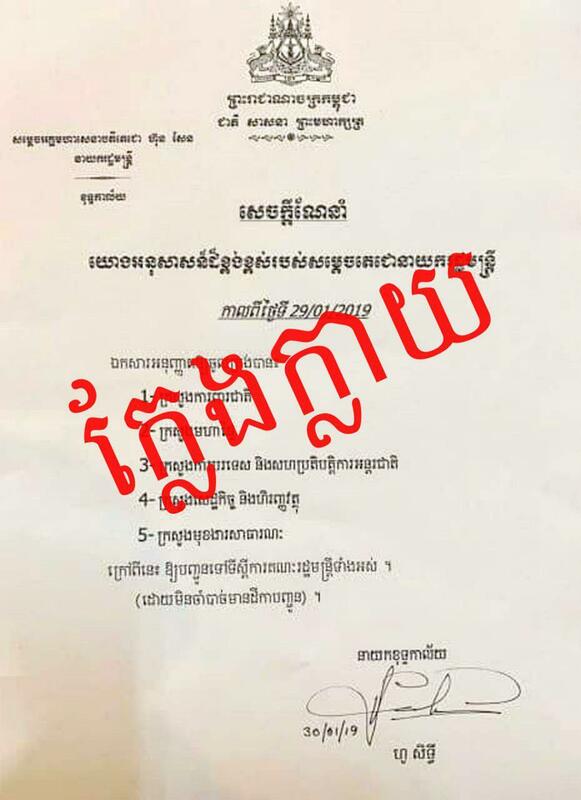 Premier Hun Sen’s cabinet chief Ho Sithy confirmed Thursday that the fake letter can be differentiated in several ways. According to Sithy, the cabinet has never issued any letters of instructions. Upon receiving recommendations from the Prime Minister, the cabinet sent a letter to the Council of Ministers to issue a letter of instruction. This fake letter of instruction did not address to anyone. Generally, letter of instruction shall be addressed to specific institutions. The official letter of the cabinet is made in light-yellow paper with the cabinet stamp, not on white paper without stamp. The cabinet chief also told Fresh News that he always uses his name seal rather than handwritten signature.